This review is a guest post written by Sarah Phillimore, barrister at St John's Chambers (@svphillimore), Bristol. Sarah joined St Johns Chambers in January 2011 from Coram Chambers in London. She has experience of all areas of family law and is training to become an accredited family mediator. Helen Oakwater is the parent of three adopted children. She thus has immediate and practical experience of the difficult issues adoptive children can face overcoming the trauma of their early years and establishing healthy attachments to their adoptive parents. She is also well versed in the theory as (amongst other roles) a former member of the government’s Adoption and Permanence Task Force. The ‘bubble wrapped’ children of the title refers to the traumatised adopted child who has tried to protect himself by a metaphorical wrapping of protective layers. The adoptive parent must help to peel away these layers to allow the child to form healthy attachments to a new family. 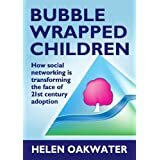 The stated purpose of this book is to discuss and analyse the impact of unregulated and unexpected contact from birth families via social networking sites such as Facebook. Again, the author has direct and painful experience of this, her own children having received such communications just days before Christmas in 2009. I discussed some of the issues around adoption and Facebook in an earlier guest post. I do not doubt that this is a serious issue which requires urgent engagement from all those who work in this field. However, I wonder whether attempting to present the book as one with a single issue focus is in fact doing it a disservice. This is more than just an analysis of the particular impact of social networking sites. It has to be, because the implications of such ad hoc contact cannot be fully understood without some appreciation of how adoptive children might be different to those raised with uninterrupted and healthy attachments to their primary carers. The book inevitably has to cover a very wide range of topics in order to allow the reader to fully understand the full potential for harm from such unexpected contact to children already traumatised by earlier life experiences. The author sets out to explain the likely nature and extent of trauma suffered by the adopted child and the ways in which the child can be helped to make sense of his or her world. She also puts herself in the shoes of the birth parents and considers how they might be thinking and feeling and how this can influence their actions. The book is thus an excellent resource for those coming new to the system and who require an introduction to the psychological theories around attachment and trauma. The author is able to present a number of quite complicated concepts in direct and vivid language, making good use of metaphor and diagrams to aid understanding; I found illuminating the example of child development as a river. Some rivers flow smoothly to the sea, others are turbulent with additional murky tributaries. Which river would you rather navigate? ‘Even though parents don’t have the professional expertise and knowledge of attachment and trauma trained therapists, they are, in the most part, expected to raise traumatised children without support or therapeutic in put from professionals’. Indeed. With an adoption disruption rate of about 25% we can’t afford to ignore this stark and sad reality. I would recommend this book to anyone who needs an introduction to or refreshment of their understanding of the current psychological theories around trauma and attachment, be they lawyer, social worker or a potential adopters. This book looks really interesting. For the other side of the picture, The Essential Adoption Guide by Iain Dickinson explains considerations before children are placed and how to make the most of the assessment.